The first time I meet Rowan Minkley and Rob Nicoll–co-founders of Chip[s]Board–I am amazed by just how strong and versatile their biomaterial is. The smooth squares of the company's eponymous material are, after all, made of only potato waste, and water. While playing with a box full of samples–both sheet-like and molded to textured, custom shapes–I ask the two young designers-turned-entrepreneurs where their chief raw material (potato waste) comes from. Impressed with the variety of hues, textures, and strengths I see, all achieved with a single kind of ingredient, I also probe into the making which determines the qualities and applications of Chip[s]Board. But first, what IS Chip[s]Board? And WHY was it conceived? The creation of two recent graduates of London's Kingston University, Chip[s]Board–the material–is a biodegradable, and non-toxic potato-based alternative to medium density fiberboard (MDF) and traditional chipboard. These two common materials are overused and easily disposed of throughout our industries today. Coated and formed with resins and glues which contain formaldehyde, these boards cannot biodegrade readily, and they release harmful chemicals both during their manipulation and disposal. Chip[s]Board's material, on the other hand, is MDF and chipboard-like in how it can be worked and used, but lacks any resins or harmful chemicals, making it a far healthier choice for both human use and environmental impact. 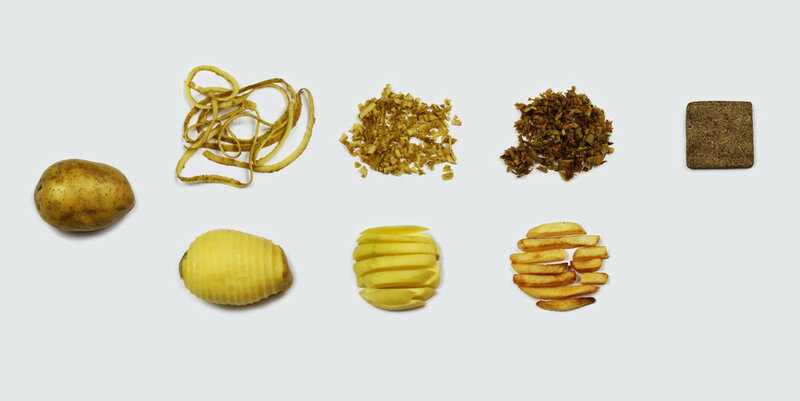 Potato waste–discarded pulps and peels–is collected from potato chip manufacturers or food companies with a large-scale use of potatoes, then brought to Chip[s]Board to be treated, and compacted, without the use of additives. What this results in, is a chemical-free, robust material that is equally if not more resistant to water, and can conversely, disintegrate in a composting facility. Chip[s]Board be used as a sheet material for a host of temporary and permanent architectural or interior applications, to generate products (both by the company and in collaboration with other designers), and be cast into ready to use custom forms–such as biodegradable cutlery. Concept furniture by Chip[s]Board, a version of the traditional milk stool, using CNC’d sheets of their material and slot together construction. On my second meeting with Rowan and Rob, at Makerversity London, where the duo have been awarded the Makers with a Mission residency, they are testing a large chunk of Chip[s] Board material for fire retardancy in a woodshop. The test, one of many that the young material-makers are doing, represents their intent to make their work definitively industry-viable. Also apparent, is the intention to upscale production so that Chip[s]Board can begin to replace toxic industry counterparts. When their production enlarges in this way, the company also plans to be sustainable in the use of all its resources–including renewable energy and grey water for production. Beyond the material itself, Chip[s]Board is representative of a strong circular design ethos. Their mission as a company centers on finding value in where others see waste. Their work with Potato waste and its transformation into a viable, and pliable material seems to be only the beginning of a promising, sustainable practice with healthy materials and products to their name. As a young enterprise, they also set a great example for other emerging material and product makers, in their consistent work towards turning a university project into an industry staple, while employing only ecologically conscious practices and techniques. For those interested in learning more about Chip[s]Board, investing in their production, or collaborating with them on projects, have a look here. If you would like to see their material and products, also look out for them at MaterialDriven's future pop up materials libraries and upcoming material-maker focussed events.